Chinese Paper Makes Unprecedented Plea For Reporter's Release : The Two-Way An investigative journalist at Guangzhou's New Express was taken away by police after reporting on financial irregularities at a local firm. A front-page commentary called for authorities to free him. A woman reads the New Express newspaper with Wednesday's headline: "Please Release Him." That was the simple but startling front-page headline on Wednesday in New Express, a cutting-edge newspaper based in China's southern city of Guangzhou. "Him" is Chen Yongzhou, one of the paper's investigative journalists who New Express says was taken away by police after reporting "problems with the accounts" at Zoomlion Heavy Industries." Bloomberg reports that Chen's May 27 story on construction-equipment maker Zoomlion "accused the company of improperly accounting for sales, forcing Zoomlion to halt trading of its shares in Hong Kong and Shenzhen. The company has denied it falsified sales." Zoomlion filed a complaint against Chen with local police last week, and he was detained on Oct. 18 for "damage to business reputation," media reports said. The arrest of Chen comes as China has sought to crackdown on what it has described as online rumors and false news. 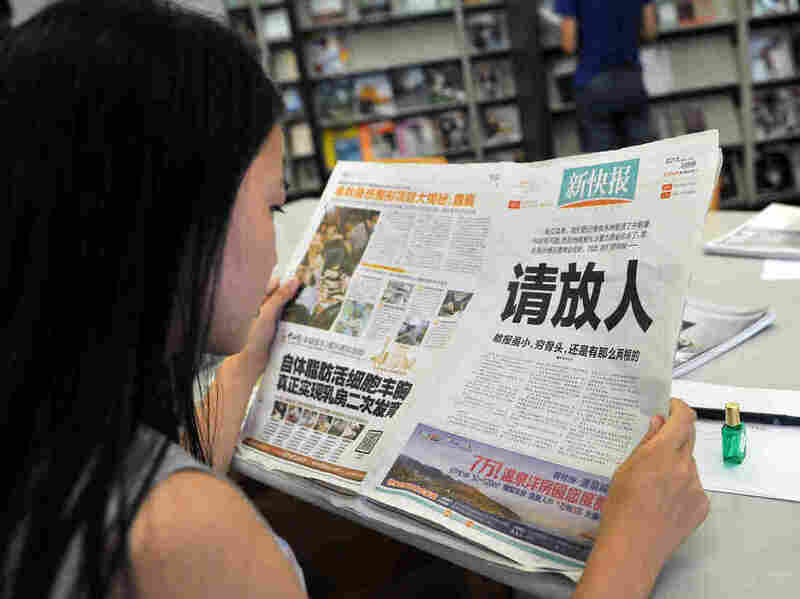 "While all Chinese newspapers are tightly controlled by the propaganda department of the ruling Chinese Communist Party, some continue to push the limits set down for them, in particular through investigative reporting of alleged corruption." New Express editors said: "We had always believed that it was enough to carry out responsible reporting and that then no problems would arise, or that if they did we could apologize or correct them or compensate [the relevant parties] through the courts, and that even if we were shut down, that we would have deserved it." "Now, events have clearly shown us that we were too naive," the article said. "Even though Zoomlion is very strong and has paid a lot of taxes in Changsha, we are still class brethren, and there are contradictions here," the newspaper's commentary pleaded. "We beg the police, our brothers, please let Chen Yongzhou go." The Hollywood Reporter says the front-page piece was "widely carried on Weibo, the Chinese version of the banned Twitter service, and also ran in Chinese mainstream media, without any obvious censorship."